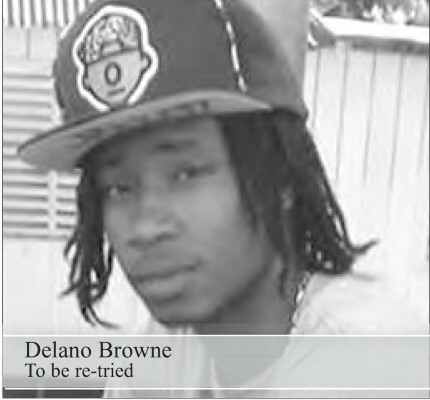 The case against Delano Browne, who is charged with attempted robbery, ended on Monday at the High Court in Charlestown, with a hung jury, so another trial will have to be scheduled and the case retried. After the verdict was presented by the jury’s foreman, Justice Lorraine Williams discharged Browne on bail as his case will have to be tried again by a different jury at a future criminal assizes. On Monday, the 12 member jury of seven females and five males deliberated for about three hours. The jury was divided on each of four charges: On three counts of attempted robbery, nine (guilty), three (not guilty); and on the count of robbery, nine (guilty) three (notguilty). The trial concluded after three days of testimony. The prosecution brought forward eight witnesses; two virtual complaints, Evelyn and Greg Salgon; four police officers, Constable Rohan Laborde, Constable Antiono Brown, Constable Damian Challenger and Constable Keshawn Charles; Ballistic Specialist Derrick Sankar; and Dr. Robert George. The prosecution led by Dane Hamilton,Queen’s Counsel (QC), based their case on what is defined as crucial evidence. According to the evidence brought forth, Browne was accused, along with another unidentified person, for attempting to rob a family on May 1, 2013 at Yachtmans Grill in Cotton Ground. During the attempted robbery, the two robbers, who the witnesses described as one being tall and the other short, were allegedly shot with Salgon’s licensed hand gun.The robbers stole two shopping bags from Evelyn Salgon.The following day, officers visited Browne’shome in Cotton Ground, where he was found with a wound to his right leg. He was taken to the Alexander Hospital where he had emergence surgery and one bullet was removed. Browne was later charged on three counts of attempted robbery and robbery. The bullet was tested by a ballistic specialist who determined that the bullet found in Browne’sleg had “similarities”to bullets test-fired from Salgon’s gun. In closing arguments on Monday, Lead Prosecutor Hamilton QC asked the jury to examine the evidence presented during the trial.